Yamaha Journey Vol.15 - Resonating Worlds | Yamaha Motor Co., Ltd. 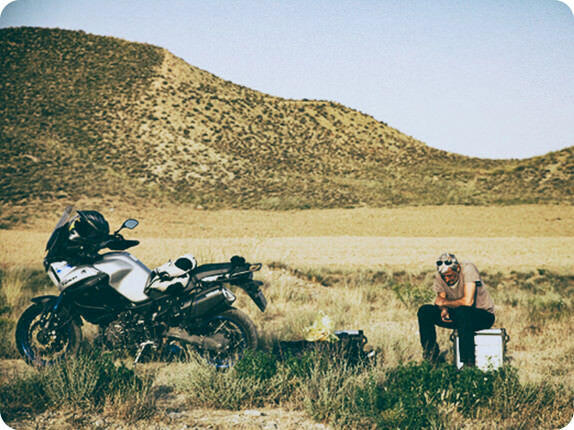 This is the story about Frederique and Aldo's motorcycle travel on a Yamaha Super Ténéré from France to Australia. #01 Eurasia: Farewell Paris and a warm welcome in Iran on the way to Bishkek. 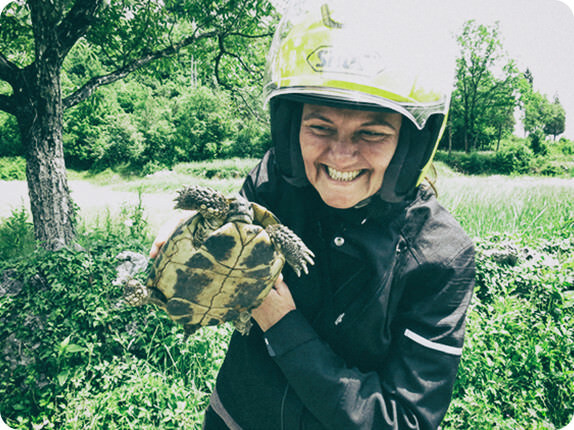 Frederique and Aldo Embark on an Epic 30,000km Motorcycle Adventure Across the globe crossing high Asia's deserts, skirting the Himalayas and riding through Malaysia's jungles to ride from Paris, France to Sydney, Australia. 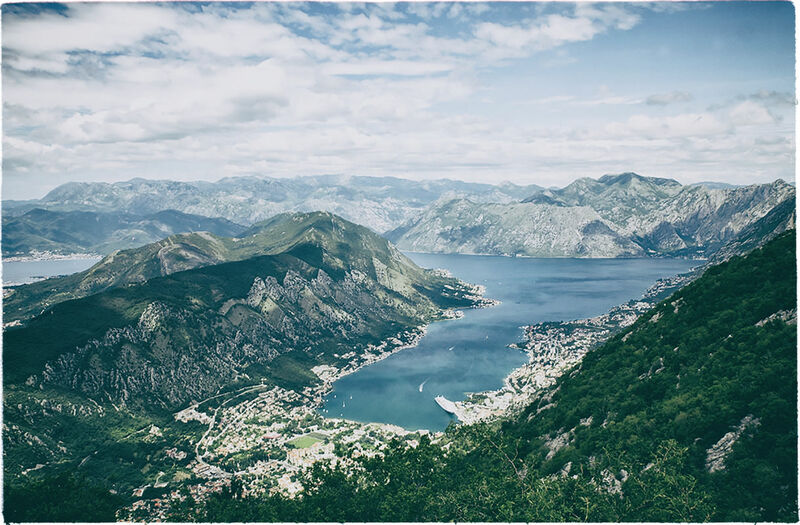 The rugged beauty of the Bay of Kotor, carved out of towering mountains by the swell of the Adriatic Sea over thousands of years. 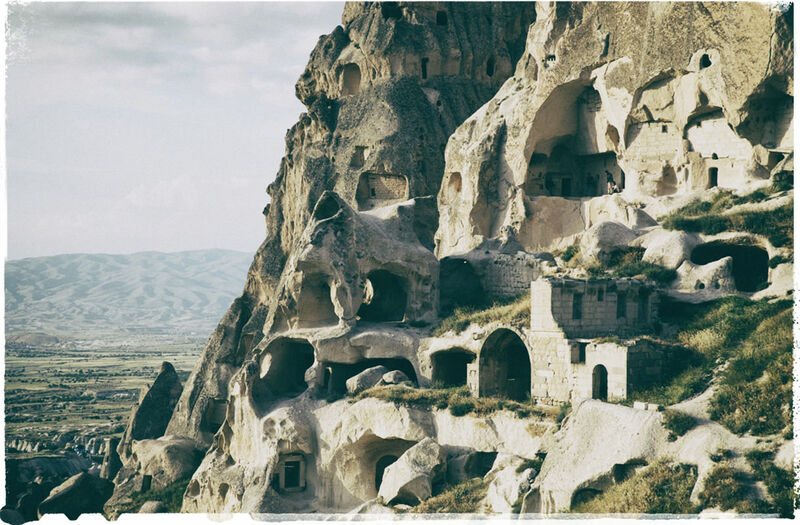 Cappadocia is an extraordinary system of caves dating back over 2000 years that features churches and homes hewn out of a rocky landscape to form a subterranean city. 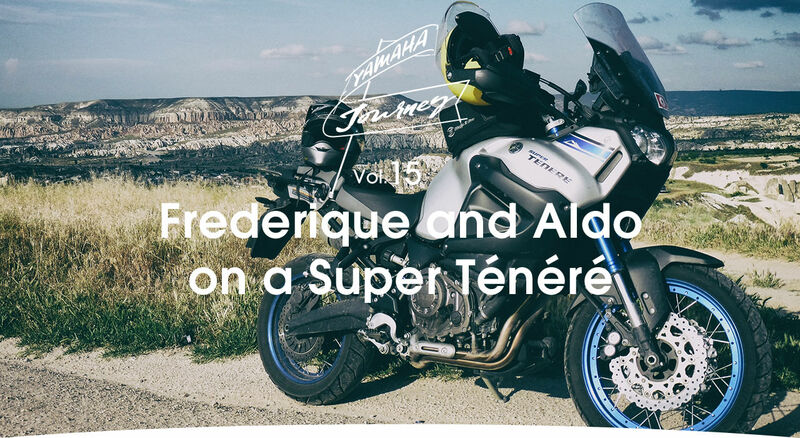 A group of people excited to see a huge tourer crowd around the Super Ténéré. The majestic Kyrgyzstan mountains: so stunning it is hard to imagine that these are a natural feature and not a photo-shopped image. We set out from our home in north-west Paris with little more than the clothes on our backs, beginning a journey that will span three continents and twenty countries. We packed in just two hours that very morning; one pannier had a computer, a camera and three lenses, and other tools. On top we had our bag which contained five T-shirts and two pairs of trousers, sleeping bags and a tent. We didn't want to plan where we were going to spend the night or even plan our route too much. It would all be decided at the last minute. We wanted our journey to be pure adventure. Frederique grips me around the waist as we head south. For years we had spoken about crossing the world by motorcycle but our four children were never old enough for us to leave them. But now they have grown up, and we finally told them we were going to take six months off to realize our dream. 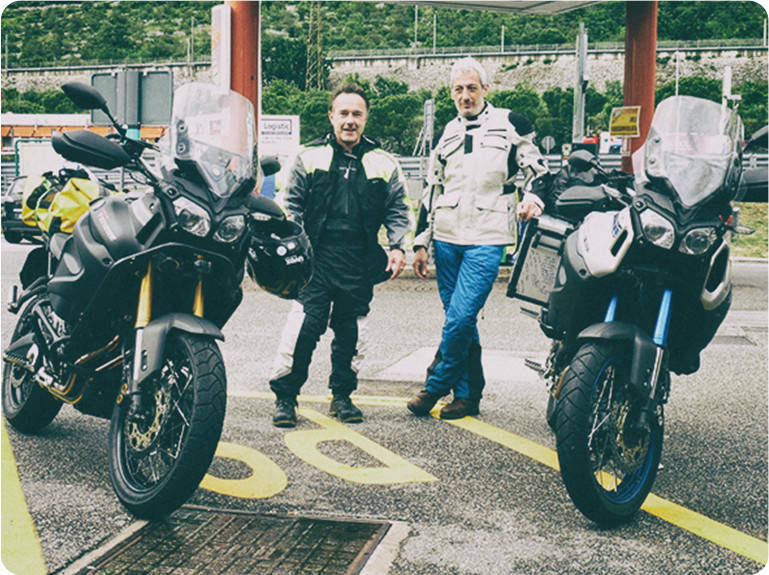 They are in our hearts as we ride south east crossing the snowy and cold alpine passes into northern Italy. As the road stretches out in front of us the powerful Yamaha carries us to the border with Slovenia. As we are getting petrol, another Yamaha Super Ténéré, exactly the same as ours, pulls up alongside. 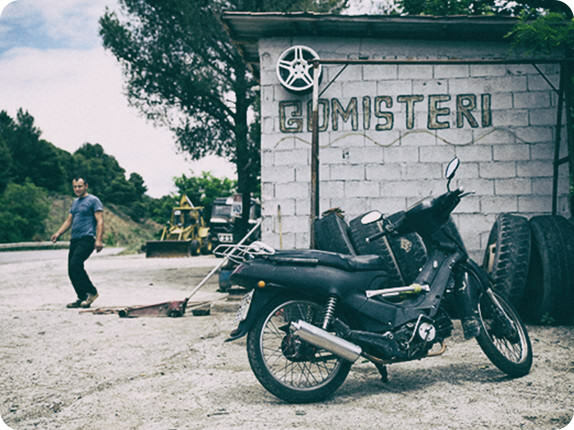 It is ridden by a German man called Dirk heading to Albania on vacation. Immediately we become travel companions on matching machines. 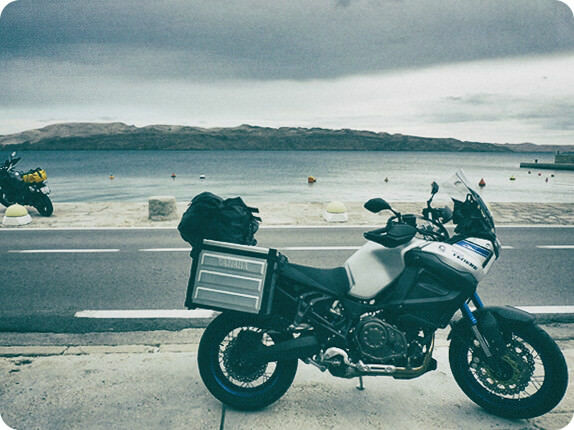 We eat up the miles but slow as we trace the Adriatic Sea in Croatia. The fresh scent of sea salt fills our nostrils. The rugged beauty of the rocky coastline leads us into the fairytale 16th century city of Dubrovnik, a world heritage site, and a walled city of renaissance stone. 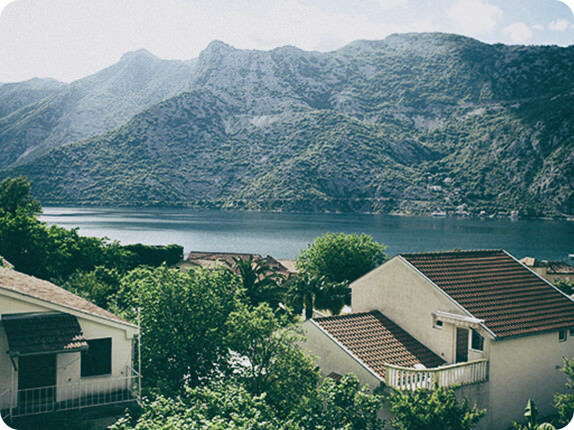 We carry on south to linger at the Bay of Kotor, a craggy inlet with monasteries overlooking the churning sea. 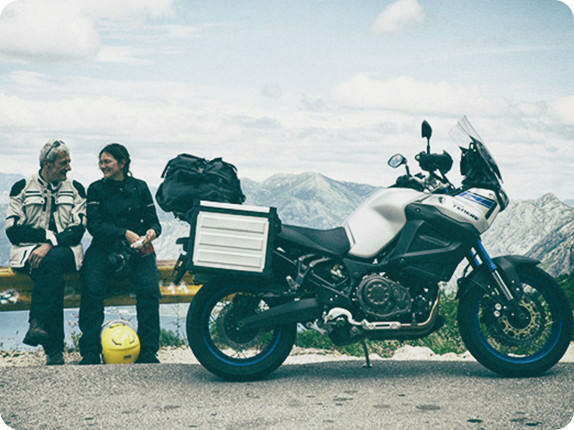 On we press through Montenegro before crossing into Greece, our eighth border crossing in around ten days. 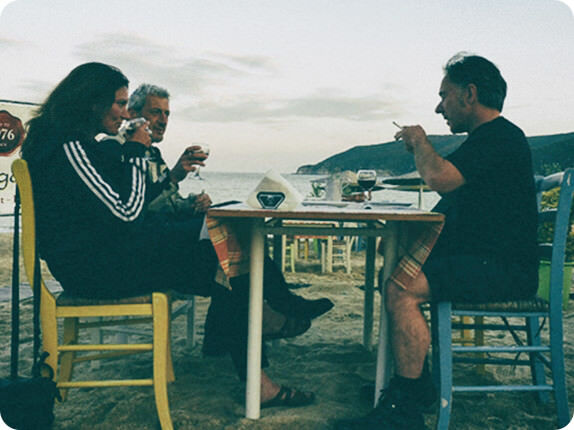 We stop in the pretty seaside town of Kalamitsi where we feast on mouth-watering Greek salads on the beach facing an opal sea. The waves lapping at the beach are so hypnotic that we fall asleep on the sand. 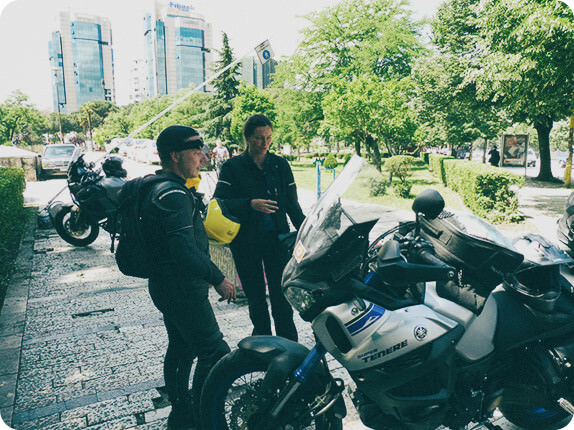 The following day we ride into Istanbul over the giant Bosphorus suspension bridge that links Europe with Asia. For the first time realize we are a long way from home. A sign on the other side reads, “Welcome to Asia.” It is my fifty-first birthday. The next day we venture into the Grand Bazaar which has 4000 shops set around 61 streets and dates back to 1400. 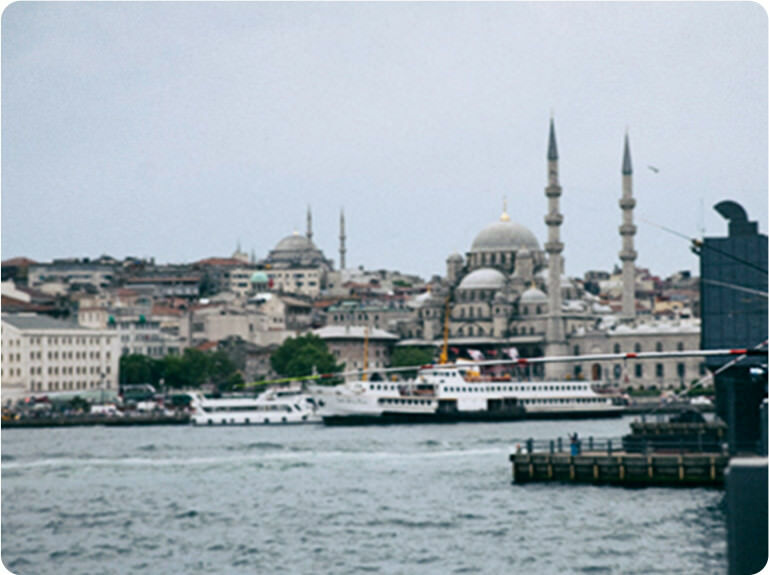 Afterwards we visit the towering Blue Mosque, thrilling to the sound of mid-afternoon prayer and a powerful sense of ancient history. 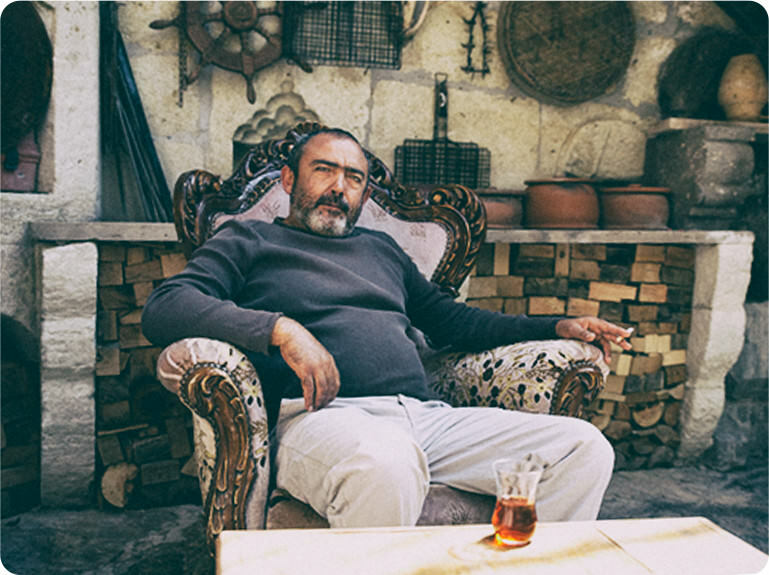 Finally we bid farewell to Dirk, promising to see him in six months, before we journey south east and cross the endless sweep of the Anatolian plateau. 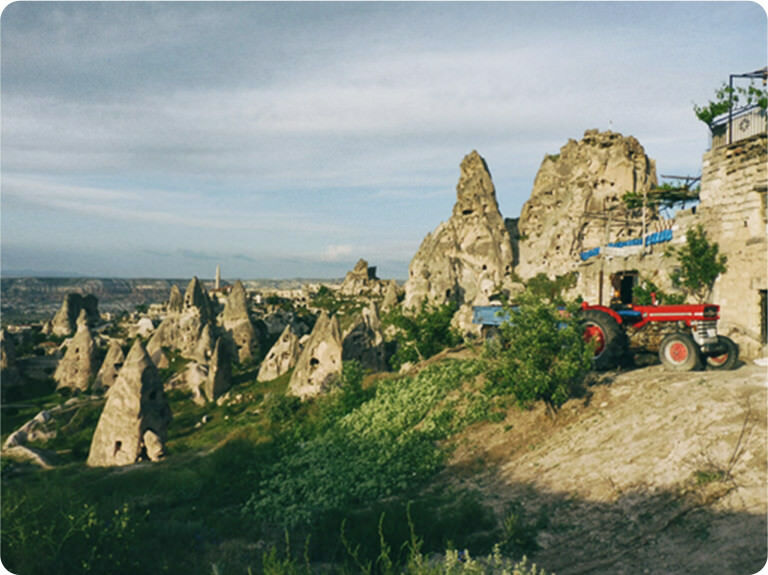 We arrive in the folkloric landscape of Cappadocia with its volcanic peaks and strange rock formations like the fairy chimneys. There are caves hewn out of the mountainsides, once home to cave-dwelling communities, which look like something from a science fiction movie. 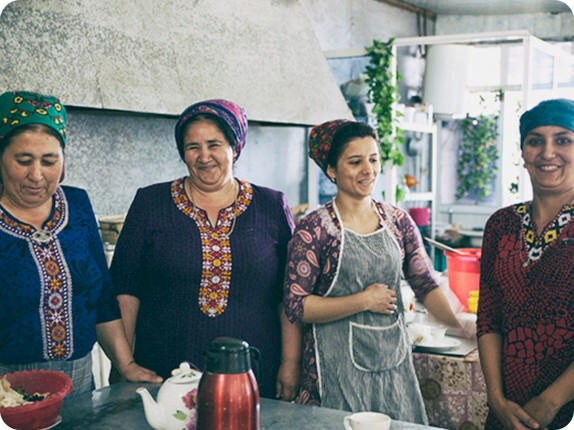 We fall into conversation with a local farmer before he invites us back to his house for tea. 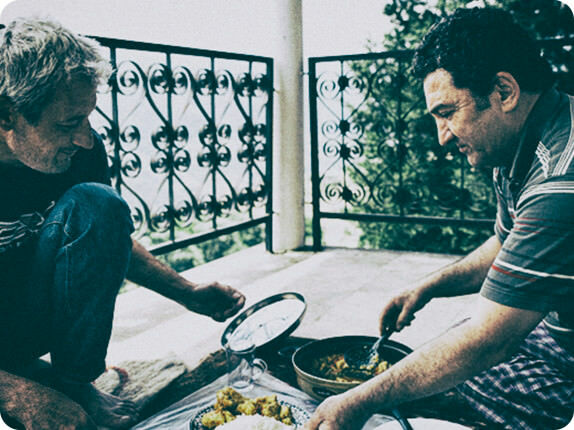 He tells us that he stores his potatoes in the caves which are like a natural refrigerator. Next we look for a place to spend the night. Frederique goes to look at a beautiful old hotel with a rustic courtyard and a marvelous room with luxurious white sheets on a king size bed and a commanding view of the valley. But when she hears how expensive it is she begins to leave. The owner passes her on the way out and asks why she is not staying. 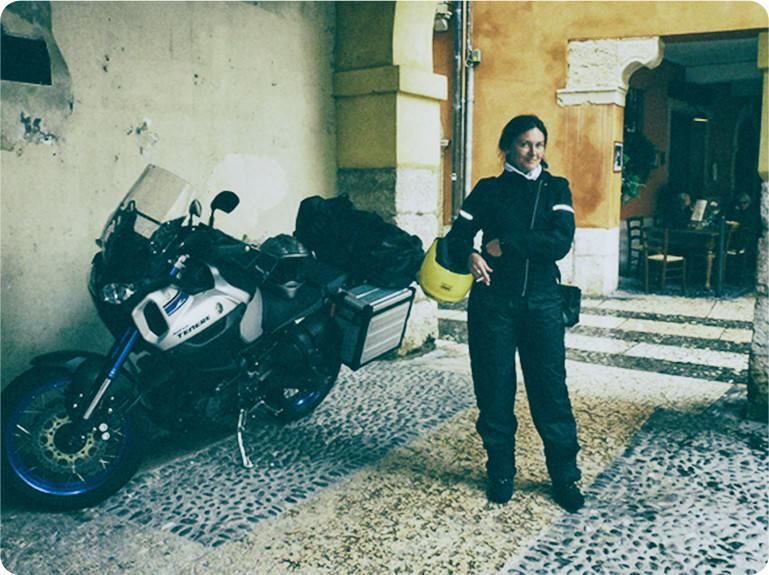 She says she is on a tight budget but when he hears about our incredible journey, and he sees the motorcycle outside, he says, “Come in and stay as long as you want! 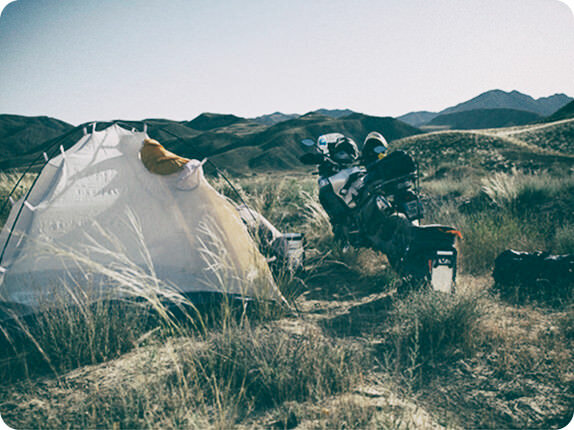 Only pay what you can.” We enjoy a luxurious night and are overwhelmed by the kindness people present towards motorcyclists. 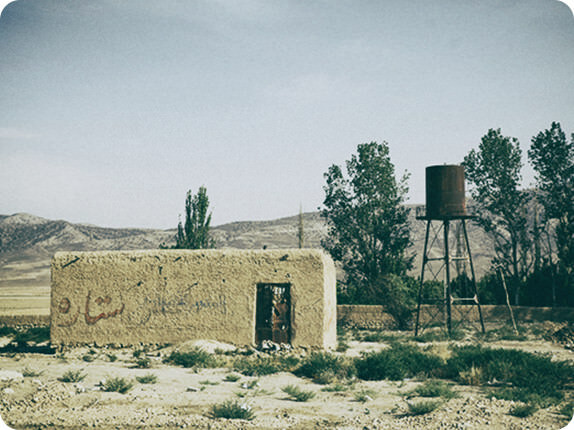 The following day we cross the border into Iran. 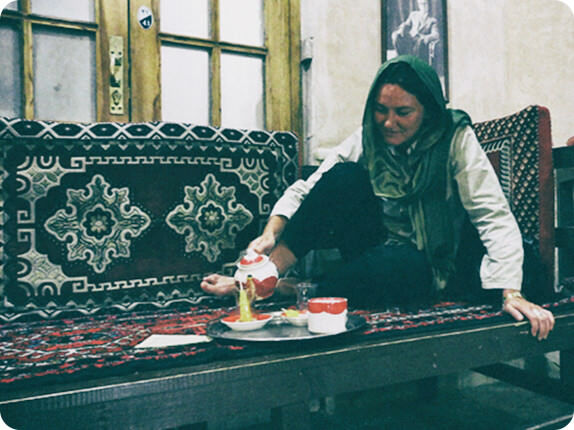 In the searing midday heat, we stop at a little town on the way to Tabriz to eat. Immediately we are swarmed with a group of people who are excitedly checking out the motorcycle. 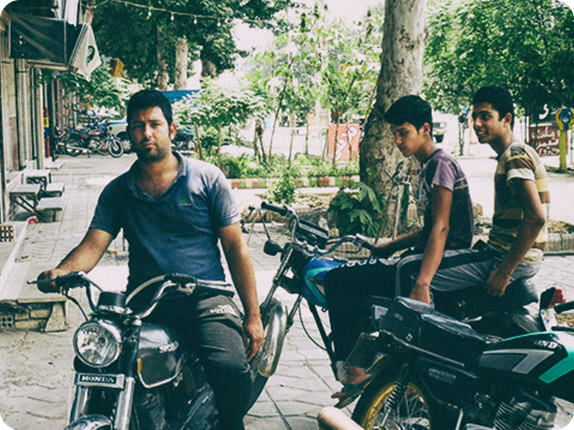 In Iran it's not so common to see larger bikes, so ones like ours are somewhat of a rarity. Grinning youths sit on the bike and take proud pictures of each other. 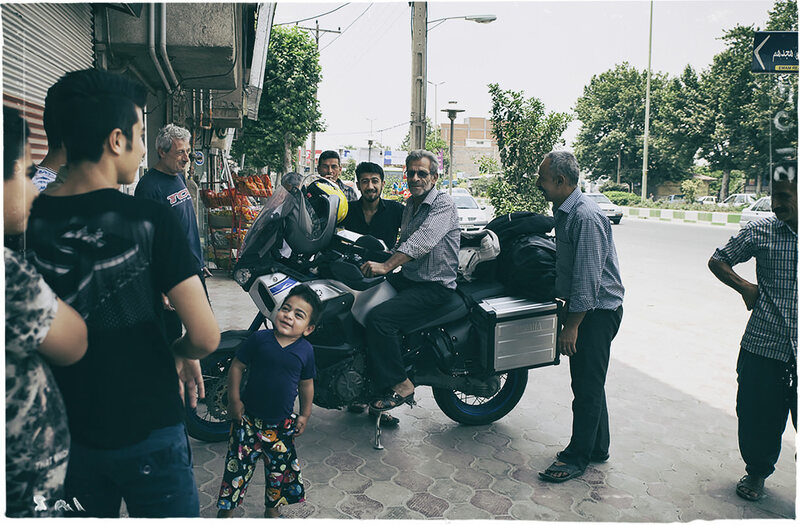 Soon after we ride into Tehran looking for a friend's house, we immediately get lost. We cover 180km in 56 degree heat trying to find our way in different suburbs. Finally, we reach Saber's house. 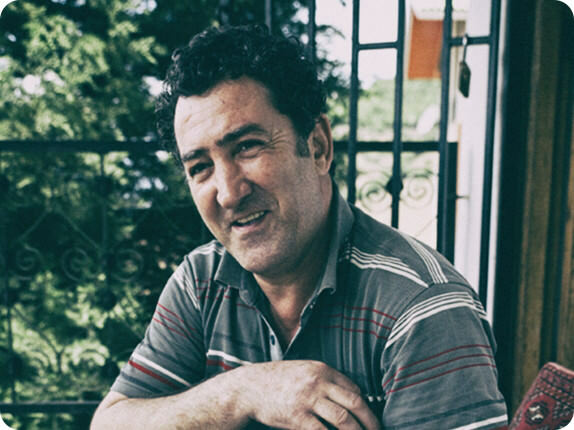 He is a friend of a friend and a wholesaler of vegetables. 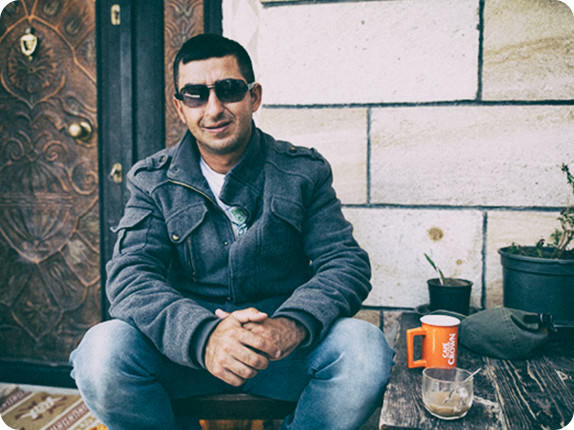 He takes a few days off work to take us to his house in the mountains near the Caspian Sea. He insists on paying for all our food and even fuel for the motorcycle. We love the cool mountain air after the heat of Tehran. 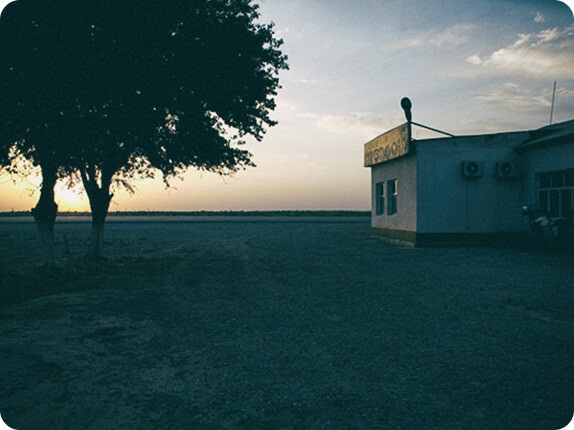 The next day we set off for the border of Turkmenistan. After a full day on the road we decide to erect our tent in a remote and beautiful spot in the mountains. We lay under a spread of stars that look like diamonds thrown across black velvet and enjoy a simple meal of bread and cheese, with a few fruits, while thrilling to the sense of freedom and the power of the mountains around us. At the border it takes five hours to get permission to enter Turkmenistan, one of the most heavily restricted and secretive countries in the world. 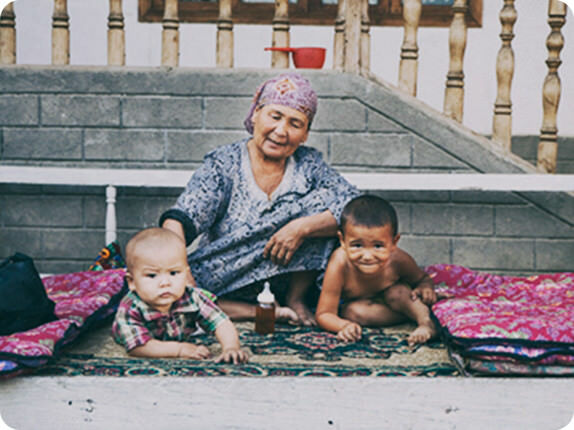 Women in colorful dresses and scarves (very different to the black dresses they wear in Iran) are carrying carpets into Turkmenistan to sell. 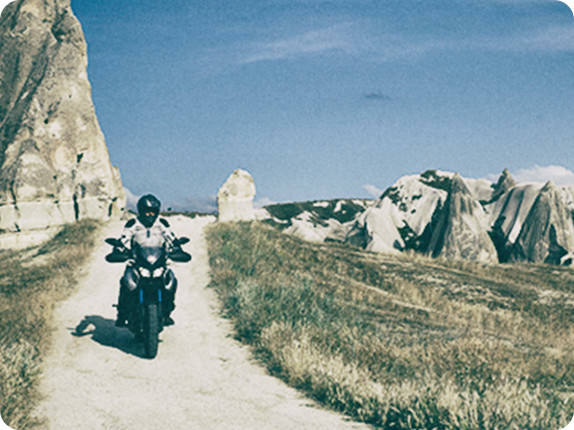 We ride through an arid land that was once a crossroads for the world's greatest civilizations and the first stop of the Silk Road, the ancient trade route between Europe and China. 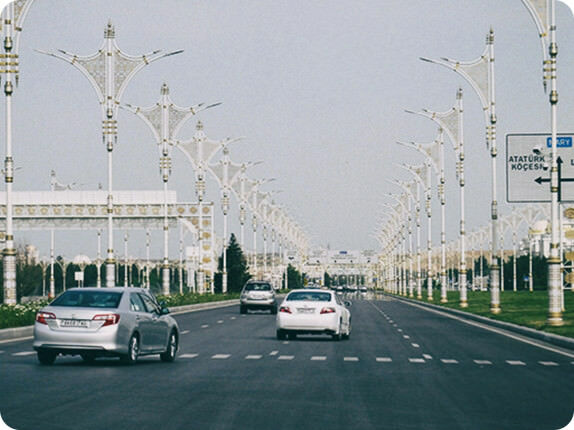 The capital Ashgabat is a shiny white marbled city with pictures of the president at every turn. We only have a transit visa for a few days so we decide to press on and stop at a small restaurant. The place is owned by some young guys in their twenties. They are kind and curious about our trip. Even though neither of us could speak the other's language we understand each other with sign language and a little bit of basic Russian. They suggest we spend the night there. We sleep on the low table we had eaten from but there are so many mosquitoes we decide to set the tent up in the room to keep them out! 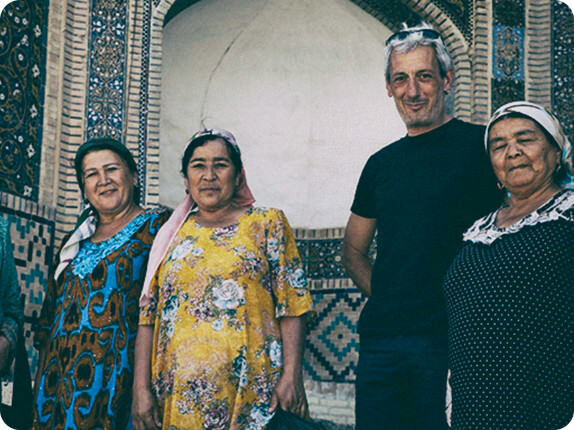 At the Uzbekistan border we meet a German cyclist riding to Australia like us. 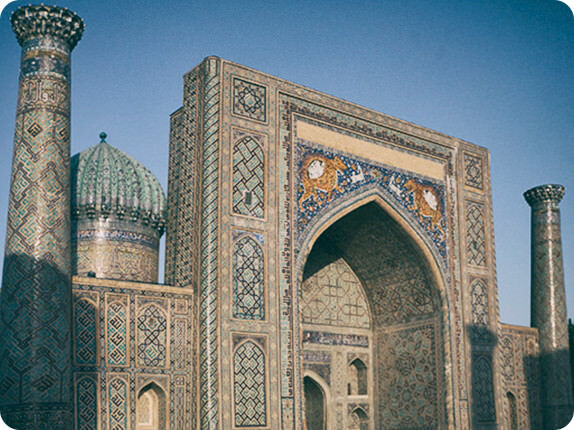 When we roll into Bukhara we are stunned with the sight of beautifully crafted stone mosques and madrassa, the Islamic educational institutions, all evidence of a civilization stretching back five millennia. We book into in a small hotel and realize we don't have any local currency. We ask the owner to get us some change from fifty euros. He returns with a plastic bag overflowing with money. We feel like millionaires! A day or so later it is time to set out east. 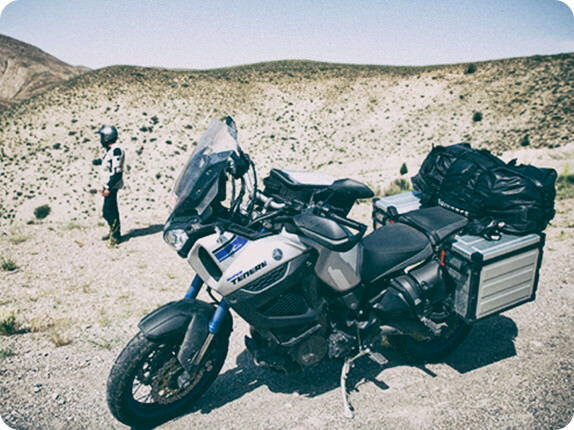 The roads are the bumpiest we have encountered and Fred's back starts to ache before we happen across a beautiful turquoise lake set like a jewel in a rocky landscape. 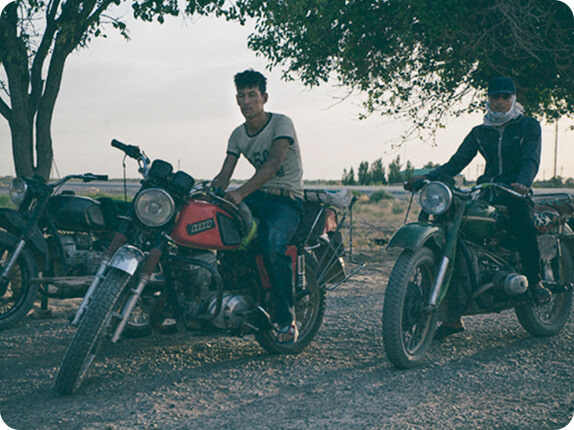 We stop to take pictures before we ride into the lushness of the Fergana Valley. This was the center of the cotton trade in the region. 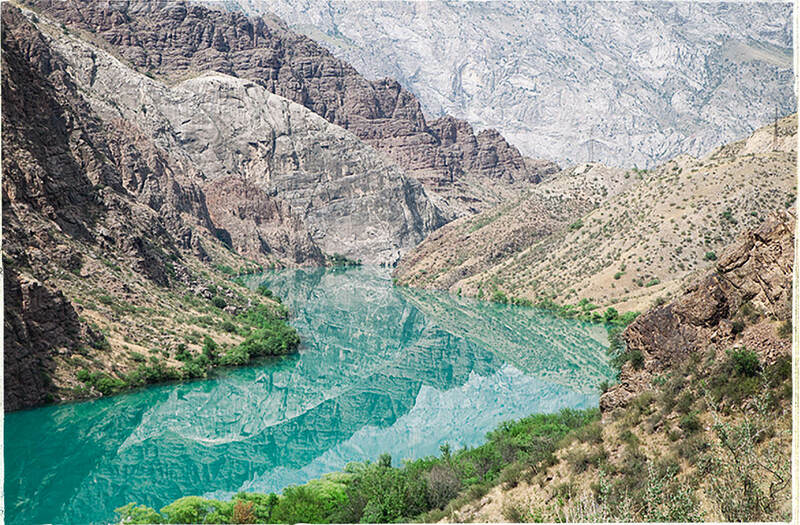 The hillsides blaze with vibrant emerald green grass, like a pool table. 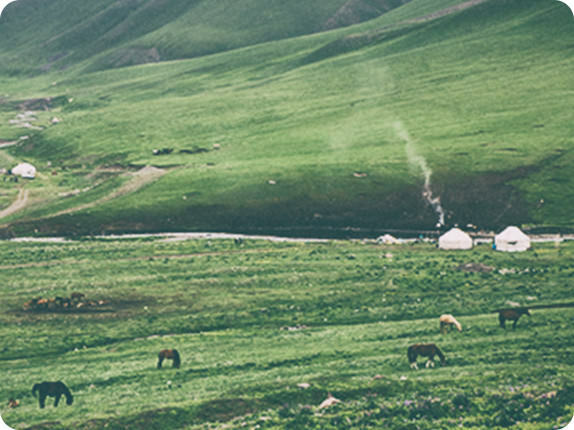 We stop in the little village of Andijan and ask if there is a good spot to camp. 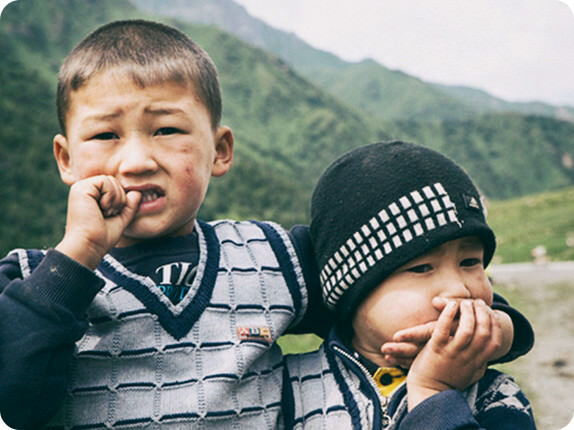 A villager takes us to a family who offer us a place for the night. Again, we struggle to communicate but we learn that they were giving up their bedroom for us while the woman and her two children will sleep outside. We are overwhelmed and amazed at how kind total strangers are to us. 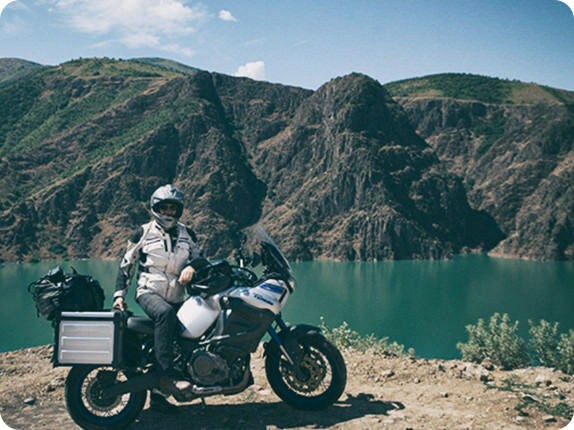 The following day we cross into Kryzygstan, the Ténéré climbing into snow-capped mountains. 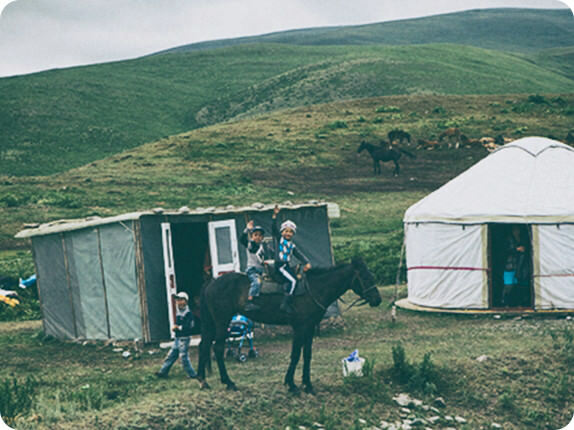 We see nomads living in yurts, the portable round tents that are a common sight in this part of the world, their horses scattered around them on the hillsides. Two boys approach us nervously and we give them chewing gum. At 2500 meters, one of the highest passes, the rain pelts us. 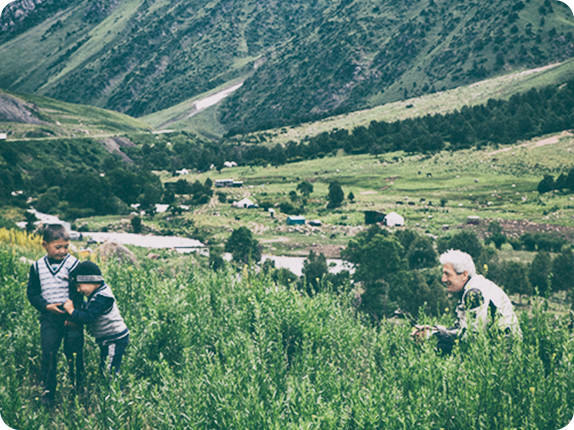 As we sweep down the valley from the mountains towards Bishkek we notice the temperature warming, and then a sense of triumph when we pull into the city. We find a small hotel that teems with travelers like us: a Japanese guy who is riding around the world on a bicycle. 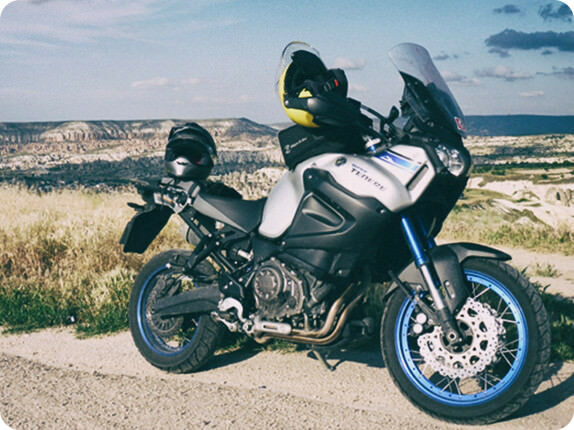 A French guy who has packed in his job and is traveling around the globe too. 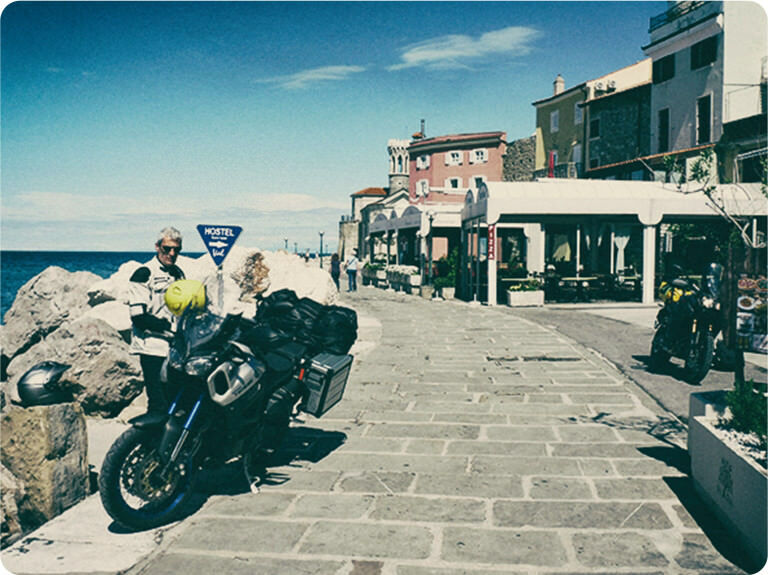 We have ridden a third of our journey, covering 10 000km, crossing 14 countries. 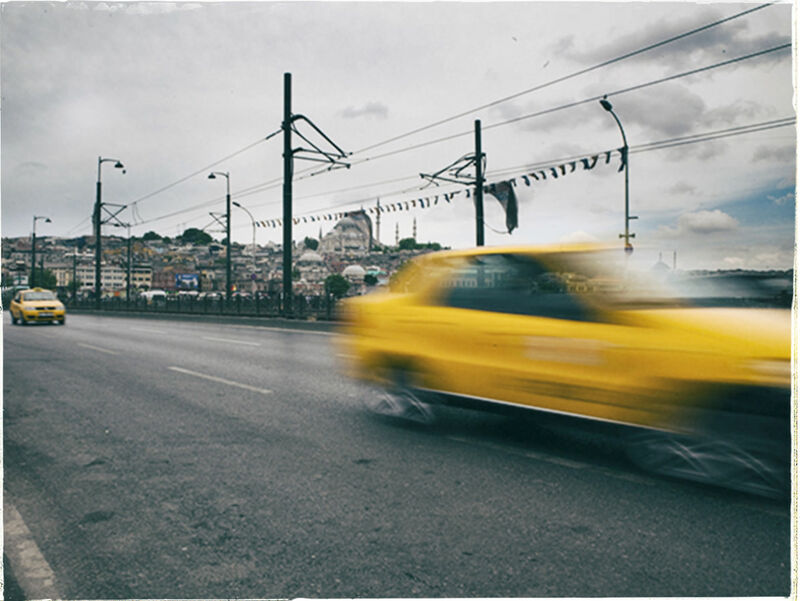 But the real adventure is only just beginning. 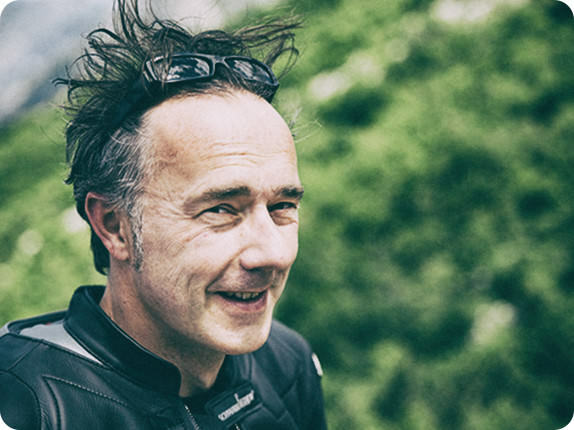 Fred and Aldo are a unique combination, a husband and wife team: Aldo producing words, and Fred pictures, to jointly illustrate their motorcycling adventures. 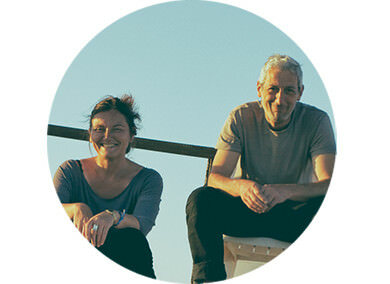 They live to travel and meet new people and their Australian odyssey took them across twenty countries encompassing a total of 30,000km. 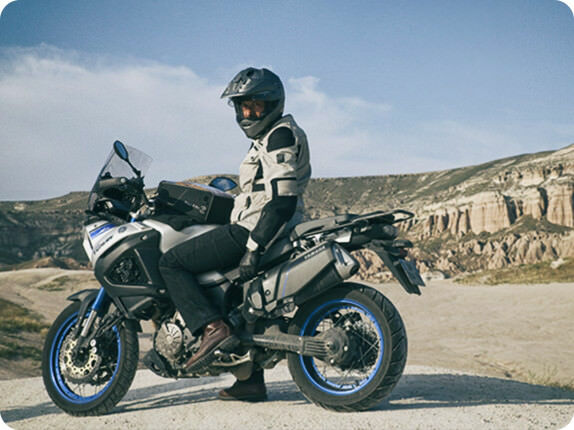 Since the successful completion of their first major trip they are now planning to cross South America by motorcycle.